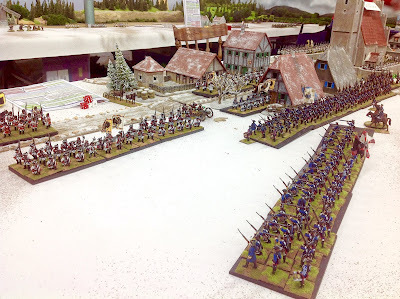 Can Kunersdorf be Fought Without Cavalry? Here is a list of all of the wargame units that I painted in 2018, all of which are Seven Years War figures. 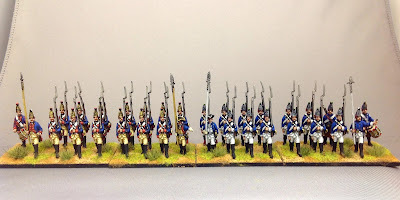 Click on the links to go to the blog post that covers each unit that I painted. 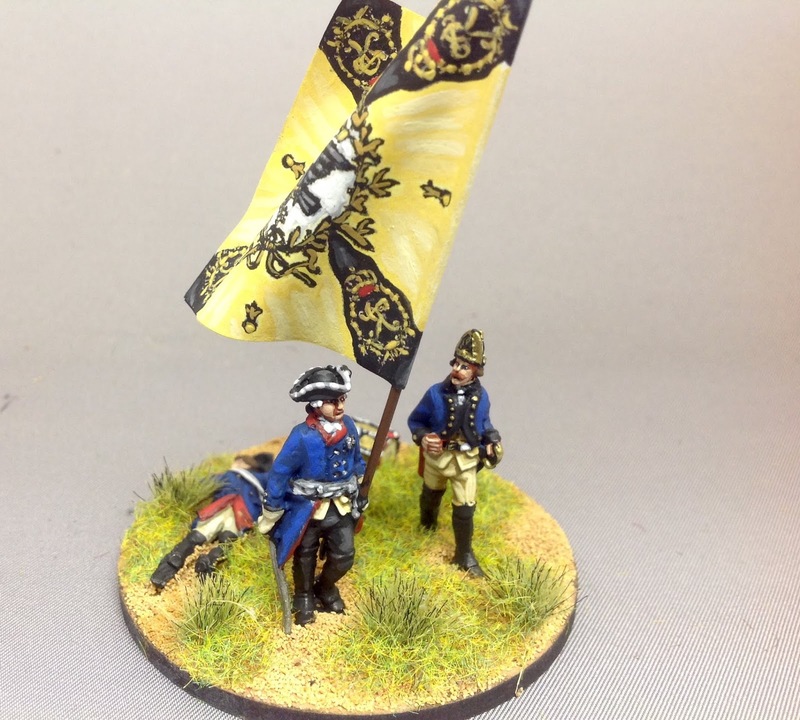 The Austrian Musketeer regiment Lacy, showing a new basing style that I am contemplating. If my math is correct, the total number of figures painted in 2018 was 652 figures. 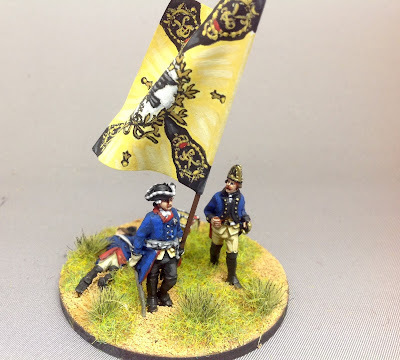 There are probably more than that if I include some vignettes that I made and some samples that I painted for the Fife & Drum on-line webstore and catalog. Now in some of these instances, I posted the date when I flagged and based both battalions of a Prussian or Austrian battalion. 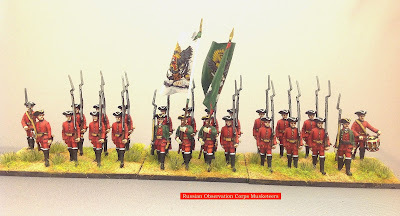 So for example, the IR2 von Kanitz Musketeer Regiment indicates 2 x 32 battalions = 64 figures. I did not paint all 64 figures at one time, but rather, over the course of several weeks. My painting pace is approximately one unit of 32 figures per week, although I do not paint every week. I wish! 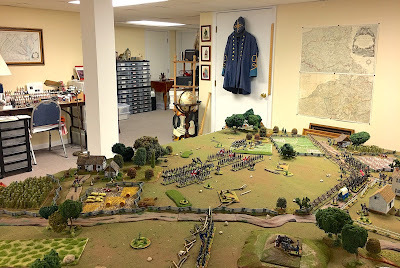 I did a count of the wargame battles that I fought in 2018 and found that I crossed sabres 14 times during the year. 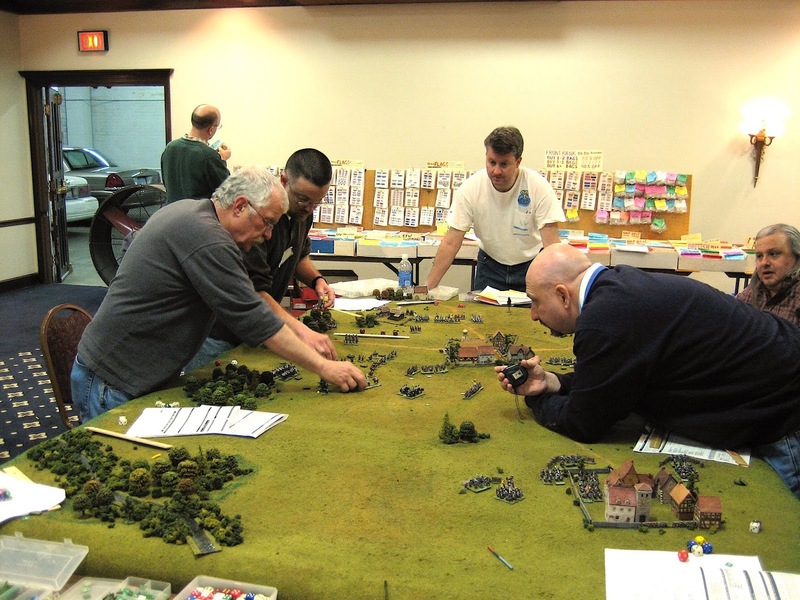 Four of the affairs were solo games and ten were with groups of players. SYWA convention a few years ago. Dean passed away in June of this year and he will be missed very much. Please click on the links above to go back in time and view the various game reports along with lots and lots of wonderful pictures for your viewing pleasure. 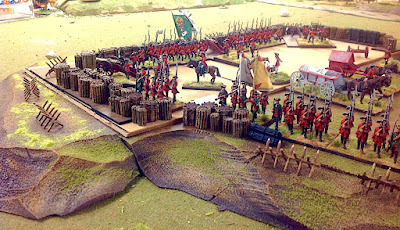 Gathering of the Wild Geese in the UK - June 2018 game. 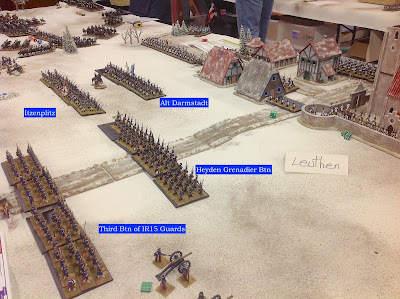 The Battle of Leuthen - December 2018 game. 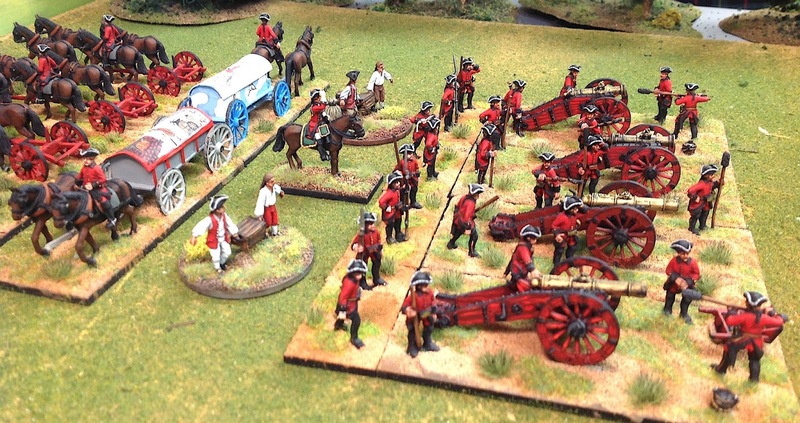 All in all, it was a very good year for wargaming that included two conventions: the Seven Years War Association in April 2018 and the Gathering of the Wild Geese over in the UK in June 2018. Conventions are a great time for catching up with old friends and making new friends. Isn't this what wargaming is all about? Book cover of "River of Doubt" by Candace Millard. 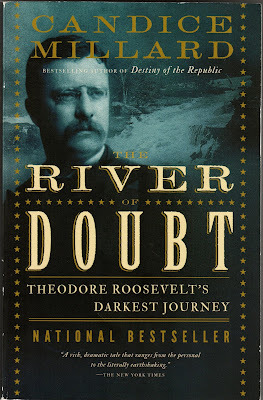 I am in the process of reading a book called "River of Doubt" by Candace Millard which tells the story of Theodore Roosevelt's exploration of the Amazon River area of Brazil in 1914. 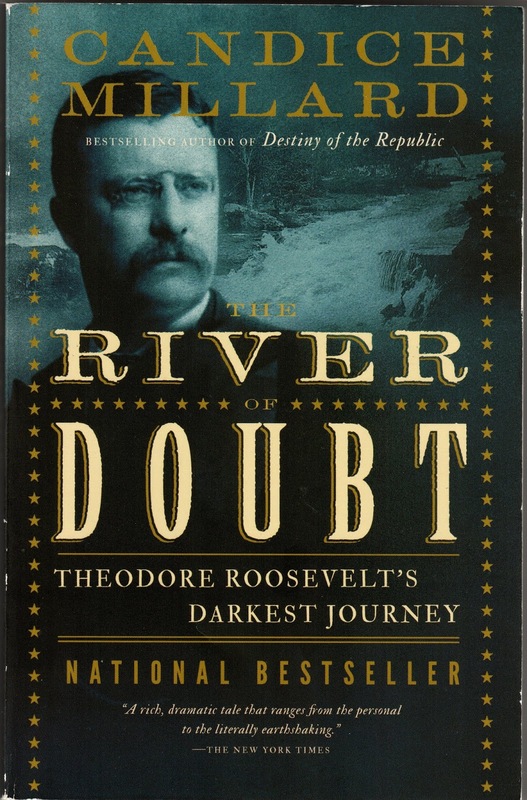 Theodore Roosevelt had recently lost his bid for a third presidential term in 1912 to Woodrow Wilson (splitting the normal Republican vote between himself and incumbent president William Howard Taft) and he set his sights on the physical challenge of making the first descent of an unmapped river tributory of the Amazon River in Brazil. The River of Doubt - it is a black, uncharted tributary of the Amazon that snakes through one of the most treacherous jungles in the world. After his humiliating election defeat in 1912, Theodore Roosevelt set his sights on the most punishing physical challenge he could find, the first descent of an unmapped, rapids-choked tributary of the Amazon. Together with his son Kermit and Brazil's most famous explorer Candido Mariano da Silva Rondon, Roosevelt faced an unbelievable series of hardships: they lost their canoes and supplies to punishing whitewater rapids, and endured starvation, Indian attack, disease, drowning, and a murder within their own ranks. In the end, three men would die, and Roosevelt would be brought to the brink of suicide, but the expedition accomplished a seemingly impossible feat, and changed the map of the Western Hemisphere forever." Ms. Millard writes a compelling story that flows easily across the pages for the reader and is one that is hard to put down. This is the style of Ms. Millard as I had previous read her book about a young Winston Churchill and his escape from a Boer prisoner of war camp, titled "Hero of the Empire". This latter book took me only two days to read cover to cover because is was so riveting and hard to put down. I bought the River of Doubt book a few years ago on the recommendation of my late mother and some of my friends, though I had not picked it up for a read. However, with my recent trip to Maui, Hawaii, I needed something to read whilst basking poolside and so I re-acquainted myself with this story. I began reading it on the return flight from Maui and I am about half way through the story in one full day's reading. I plan on finishing the book over the weekend and I can tell you that it is just as hard to put down as Millard's Churchill book. My copy is a paper back book that costs $17.00 US and was published by Anchor Books. I heartily recommend both of the Millard books. You really cannot go wrong and you will enjoy the story very much. It's like walking off the edge of the world. Yesterday my daughter Lelia and I drove to the summit of the Haleakala volcano in the National Park of the same name. The temperature change from sea level (84F) to summit (54F) was really something to behold and fortunately we were prepared with some warm coats to wear upstairs. As we reached about 8,000 feet above sea level we realized that we were higher than the layer of clouds that we could see from the base of the mountain. The road climbed ever so slowly up the hill with our driver, me, going even slower. I'm used to alpine driving, but this was white knuckle work even for me. In many places there were no guard rails between the road and the sheer drop to below, which made me very uncomfortable. The guard rails don't make safety any better, but they provide some psychological help. At about 9,000 feet I decided to turn around at a small parking lot, one of the last ones between us and the summit, so it was go,no go at this point. 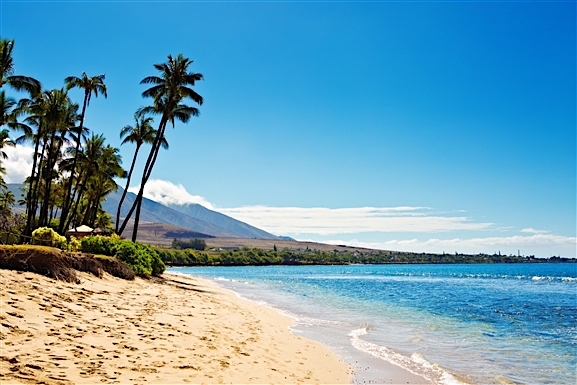 All in all it was an enjoyable excursion and I'm glad that we tried it, but if I ever return to Maui, I won't make this trip again. Today is the anniversary of the Battle of Trenton fought December 26, 1776. George Washington's rag tag American army defeated the Hessian garrison at Trenton, New Jersey thus breathing life into the American cause. I fought Trenton as a solo Wargame back in January 2015 and the Americans held form and defeated the Hessians once again. I'm blogging on the road so it is difficult to put some links to the original blog articles, but I will fix this when I return home. Well we have gotten all of those horrible Christmas songs posted on my list so now let's take a look at the twelve best Christmas songs. As you can see, many of the songs on my list are the old classic and traditional songs that we would sing while Christmas caroling (yes, we actually used to get a group of people together and go door to door in the neighborhood singing Christmas carols). Thus my song criteria is that the song has to be singable and can be sung as A Christmas carol. Der Alte Fritz and his Family wish you and yours a Merry Christmas and a Happy New Year. I decided to go ahead and do a Kunersdorf-Lite game before going off for the holiday. I will be posting the pictures and game report on this blog using the scheduled post feature in Blogger so that the posts will be placed on the blog while I'm away. 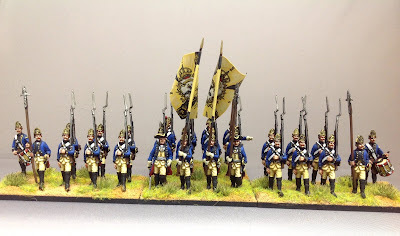 Prussian advance guard of 3 grenadier battalions. Advance guard prepares to assault the Russians deployed on the Muhl Berg. Here are some of my thoughts about the organization and composition of Allied and Prussian forces that fought at Kunersdorf. First, I wanted to remove the detached troops from the order of battle. These lucky units were left behind to guard bridges or the baggage park while the fighting was going on. How many soldiers were at Kunersdorf? The numbers vary greatly using a number of sources such as Christopher Duffy, Kronoskaf (German General Staff Histories) and Alfred Rambaud. So you have to sort of pick one and just go with it. I decided to use Rambaud as my source noting that some of his figures are identical to what Christopher Duffy has in Russia's Military Way to the West. Rambaud and Duffy present the total Prussian army at 49,000 soldiers comprised of 35,000 infantry, 13,000 cavalry and 1,000 artilllery crew. With detachments of 9 battalions guarding the bridges near Goritz and 13 squadrons of hussars guarding the left bank of the Oder River, I come up with a number of 6,700 soldiers not present at the Battle of Kunersdorf. After deducting the detachments I estimate that the Prussian army on the battlefield had 29,600 infantry, plus 11,700 cavalry and 1,000 artillery crew for a total force of 42,300 men. Rambaud and Duffy cite the Russian strength at 43,000 infantry plus 4,650 battle cavalry and 7,200 light and irregular cavalry (Cossacks). 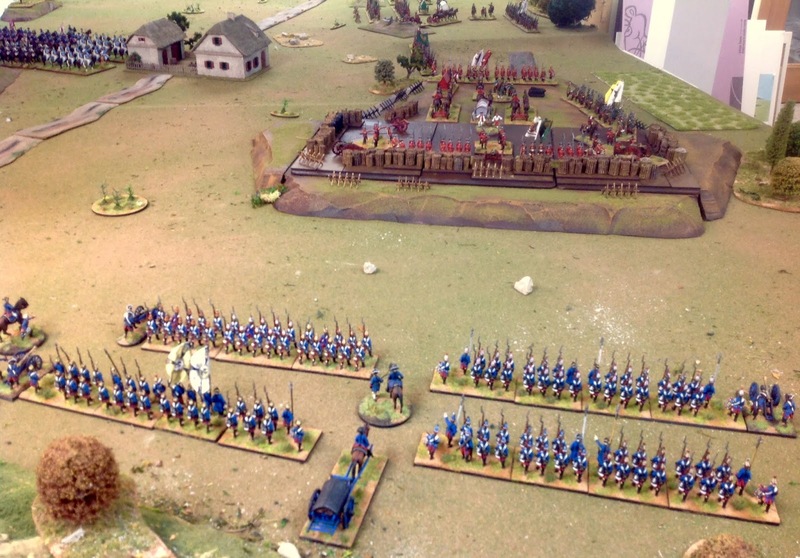 With 4 battalions of foot protecting the baggage park and removing the Cossacks from consideration as likely troops on the battlefield I generate an estimated force of 41,000 infantry plus 4,650 cavalry and 1,700 hussars for a total force of 47,350 men. The Austrians are thought to have brought around 18,000 troops to the game including 7,000 regular infantry plus 6,000 cavalry and 5,000 Croats. The Croat light infantry were largely guarding bridges across the Oder and some were at the south end of the battlefield well out of the way of the fighting to the north. So all the Croat battalions were eliminated for consideration. In addition there were two regiments of Austrian hussars (Kolnaki and Nadasdy) that were deployed near Frankfort and were not engaged in the fighting. Removing all the Croats and the two hussar regiments I estimate the Austrian army at 7,000 infantry and 5,000 cavalry for a total battlefield force of 12,000 men. I am not going to get into the artillery arm of the two sides, but after deducting lighter battalion guns the Prussians had 114 heavy cannon (largely 12-pounders) versus 200 Russian field guns that were mostly in the 6-pounder size along with a considerable number of Shuvulov Howitzers. The Austrians had 48 cannon of various sizes, but none of the sources seem to be able to break out the light cannon from the heavy field guns. Perhaps one of my readers can do some research on the artillery arm of both sides at Kunersdorf. 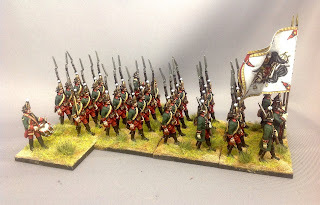 As I often do, I start with the number of infantry that I want to field for the Prussian army and then multiply that by the ratio advantage of the allies in order to estimate the allied total of battalions. 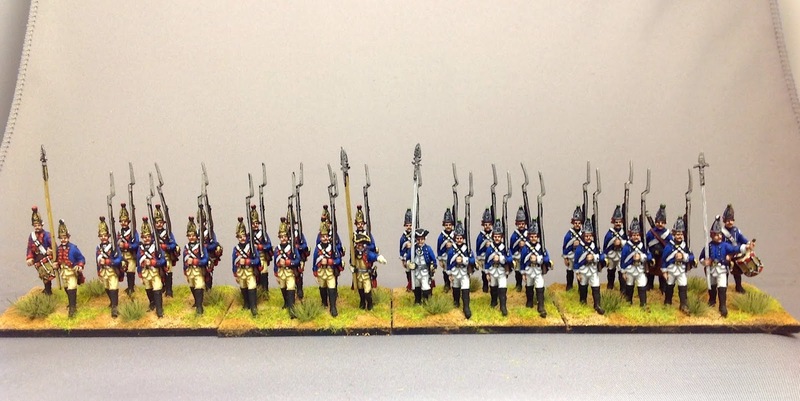 I decided on 8 Prussian battalions and 1.6x that number equals 12-13 allied. 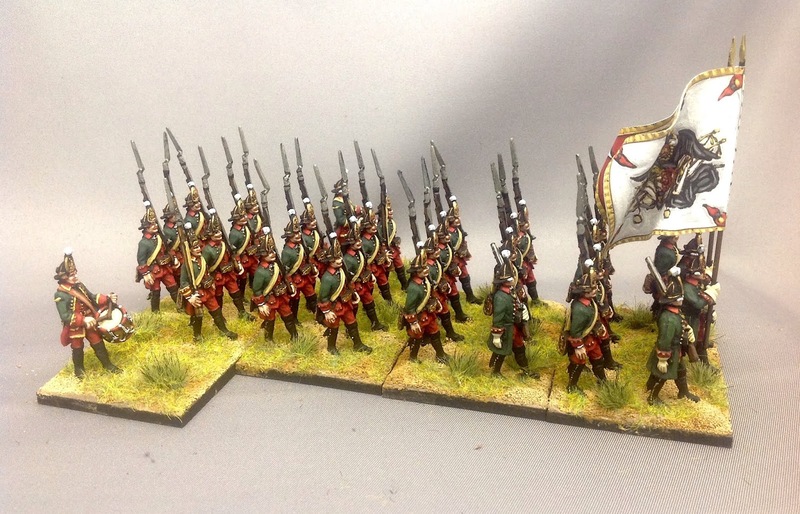 If I decided on 9 Prussian battalions then the allies increase to 14 battalions. For the cavalry, I gave the allies 3 cavalry regiments times 1.2 to equal 3.6 Prussian regiments, rounded up to 4 regiments. I used 5 heavy cannon per side on the table. 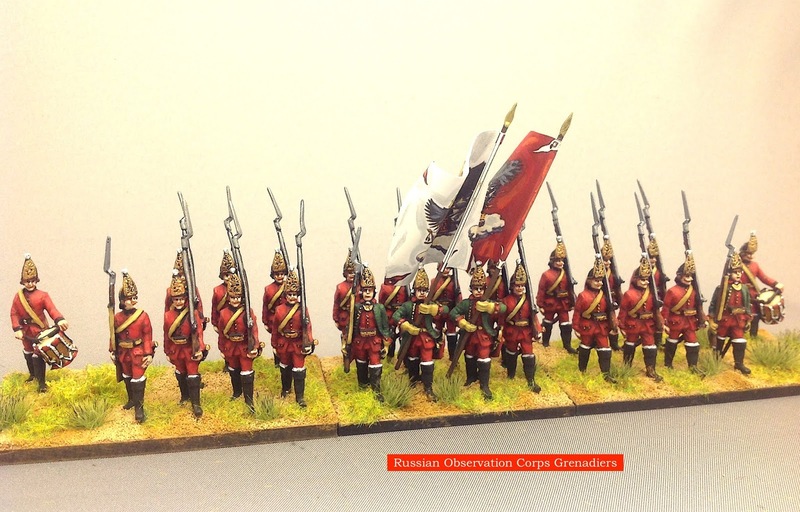 Another view of the Grosser Spitzberg, packed full of red coated Russians. Prussian cavalry deployed next to Kunersdorf, guarding the left wing of the army. The cavalry is actually starting off-table so they aren't really there at the start of the game. I will start the game as a solo play on December 17th and hopefully finish it by December 18th. Don't mess with Chips the Wonder Cat by playing any of the songs on the list. It is Selection Sunday, that time of year again when I release my annual list of the 12 worst Christmas songs that we all hear over and over again on the one radio station that plays Christmas songs. This year we have a Selection Committee comprised of Mrs. Fritz, the Princess Fritz and me, the Original Fritz. We have some big changes in the list, compared to last year, with a couple of songs making the list for the first time. In this #MeToo era I had to add a newcomer to the list: Baby It's Cold Outside. You know what I'm talkin' about. See the You Tube version of the song from the movie - YIKES! The committee added another newbie when we heard this song on the radio just this very morning - "All I Want for Chistmas is a Hippopotumus." A few of the songs on the list moved down in the ranking. I added last year's rank after the song. It's not that they are any less objectionable to me or the selection committee, but there are others that annoyed us worse. So with further ado, let's look at the horrible 2018 Twelve Daze of Christmas song list. * I don't know the name of the song but it's a group sing that sounds sort of like "We Are the Children"
Hello everyone! I wanted to let you know that the Fife & Drum Miniatures shipping "staff" are going on holiday hiatus for the next several weeks so we will be closing shop and will be open for business again on January 1, 2019. You can still place orders on the Fife & Drum webstore site here, but just be aware that any orders placed after December 18th will not be shipped until the first week of January. Should you want to squeeze in any last minute orders, the staff can probably handle and pack orders received by Noon Central Standard Time in Chicago for shipping on December 18, 2018. We want to wish all of our customers and visitors a joyous holiday season and a happy new year too. This morning I was googling my way about the internet looking for some information about a SYW era Russian officer by the name of Tottleben, who commanded the Russian light cavalry (hussars and Cossacks) during the 1760 campaign. 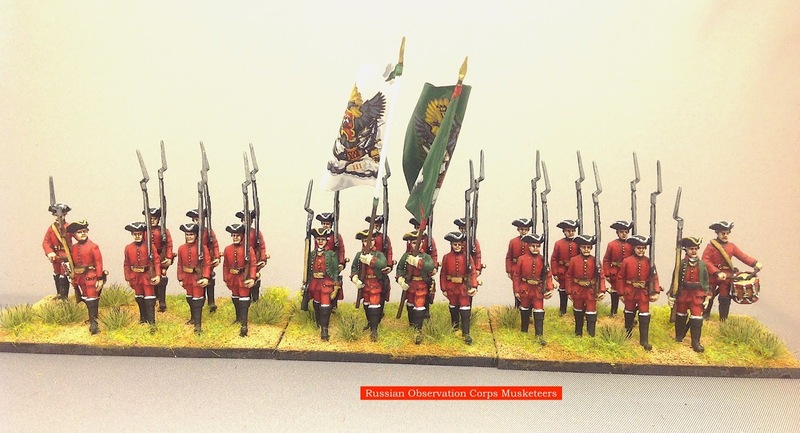 Russian Cossacks - RSM Miniatures mounted on Minden Miniatures light cavalry horses. My search revealed a new painting/image, at least for me, of the Russian raid on Berlin in 1760 by an artist named Alexander Kotzebue, called "Einnahme von Berlin (1760)". See the top of this page for a copy of the picture and then click on the picture to enlarge the view. The painting depicts what appears to be several formations of Russian cavalry on a grand plaza in central Berlin. The painting was done in 1849 so it appears that some of the buildings in the background are of the mid 19th Century architecture, so some artistic license is used in the picture. In any event, I have seen a lot of paintings of the events and people of the Seven Years War, but never this painting. So I was rather pleased to have made its discovery. I also found a colorful map, in Russian, of Berlin at the time of the 1760 raid, I think. It could be a map of the 1757 raid by the Austrian general Hadik. Engraving of the Russian raid on Berlin in 1760. I refer you to the Kronoskaf account of the raid, which took place on October 7, 1760 with the temporary capture of Berlin on that date, for detailed information about the raid. 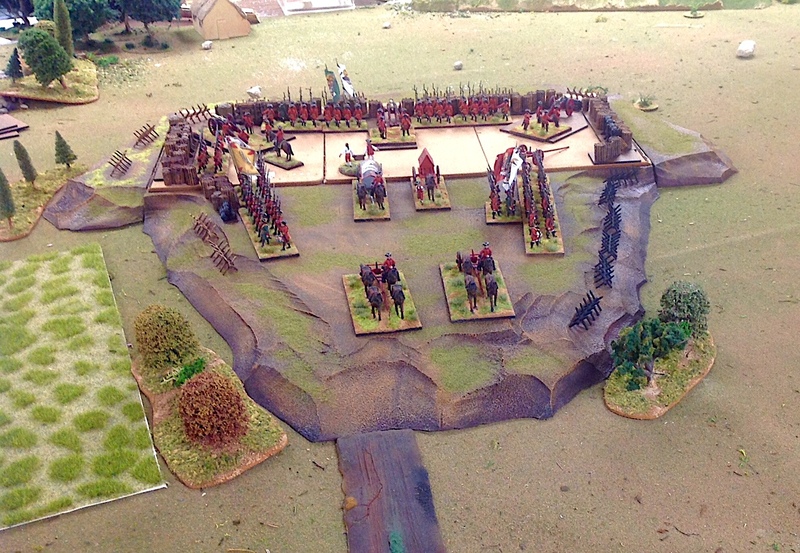 The Russian cavalry was largely deployed in dead ground on the far right of the battle line. The majority of Prussian cavalry was deployed on the Prussian left, behind the three large ponds and the village of a Kunersdorf. If the Prussians focused solely on the fight for the Muhlberg and Kuh Grund and Spitzerberg, then they would not have needed to send the cavalry into the battle, knowing the difficulty of filing through the ponds area and then redeploying under fire from Russian artillery. 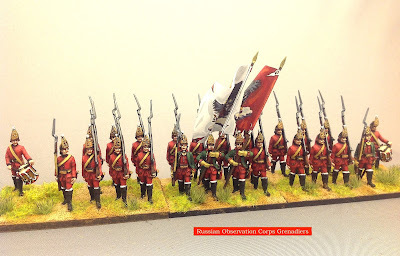 So if the Prussian cavalry does not advance, remaining the refused wing of the army, then the Russian-Austrian cavalry never has the opportunity to charge into the Prussian cavalry. The terrain obstacles restricting the Prussians would also have deterred the Russian cavalry from attacking. Ergo, no cavalry action in the area beyond Kunersdorf village. The Muhlberg hill at Kunersdorf. Click all pictures to enlarge the view. 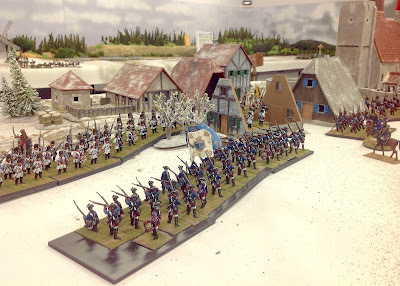 With the 260th anniversary of the Battle of Kunersdorf, in the Seven Years War, arriving in 2019 I have been working on creating a table top scenario to refight the battle. One of the great terrain needs is to build the Muhlberg hill that anchored the left flank of the Russian defensive position. The Russian Observation Corps troops occupied the hill and dug in behind a wall of gabions, fascines and cheveau de frises. Accordingly, I will need a lot of earth works pieces to fight this battle. This weekend I started work on the Muhlberg hill, constructing it out of 2-inch pink foam insulation board that you can purchase at any DIY store. I used a hot wire knife to sculpt the board into a passable looking rise in the ground. Once the sculpting and terraforming was done, I sprayed a dark brown coat of Krylon paint over the surface and let it dry for an hour or two. Then I followed up with another spray coating of a lighter shade of Krylon brown paint, working from a dark layer to successive layers of lighter brown paint. The next step was to break out some of my old Howard Hues acrylic paints, notably Geo Hex Brown and do some extensive dry brushing over the surface of the hill. Eventually I will lay down some Woodland Scenics green flock and seal it with Dull Kote or watered down PVA glue. I did an experiment with the flock and some static grass, just sprinkling some of each over the surface, without gluing. I find the static grass to be too bright, so I am going to go with the grass colored flock going forward. 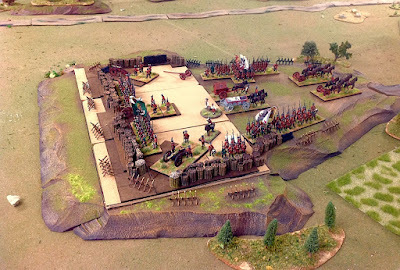 View of the rear of the Muhlberg position. The low area behind the position is the Kuh Grund. My plan is to make some earthworks/gabion modules affixed to a cork board that measures 8-inches by 16-inches, cut from a cork-backed table mat that I bought at Target Stores in their kitchen wares section. The edges of the cork section will be filed down to achieve a tighter fit to the adjacent module. The boards will also be spray painted with the dark brown undercoat, but then I will glue down the gabions and fascines and then trowel over some wall board paste that is mixed with brown paint. Another name for the paste is Spackle Compound. After that, more dry brushing over the ground part of the module and then it should be nearly finished. The front elevation of the earthworks. Front left corner gun position. Front right corner gun position. Close up view of the left side of the Muhlberg. Stay tuned in the future for more reports on the progress of this terrain project over the next several weeks. 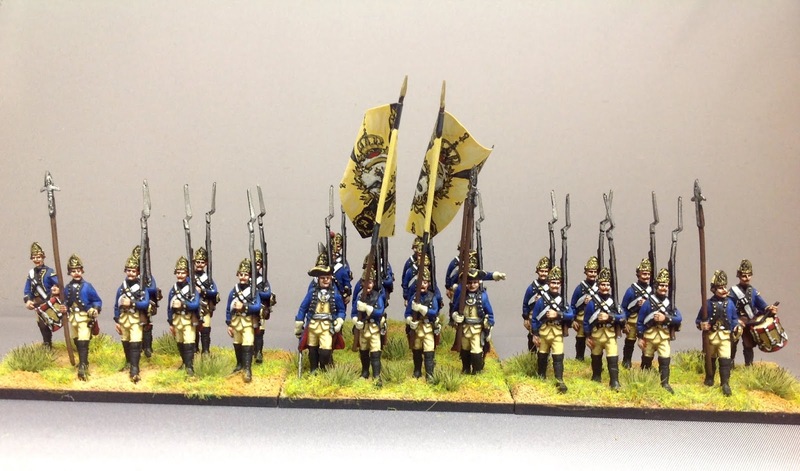 defended by the Rot Wurzburg regiment. (from Dorn & Englemann). Today is the 261st anniversary of the battle of Leuthen, Frederick the Great's signature victory over the Austrian army commanded by Charles of Lorraine. One of the key actions during the battle was the heroic defense of the walled churchyard by the Rot Wurzburg regiment in the Austrian army. The Wurzburgers fended off a number of attacks by the Prussian Guards before succumbing to the weight of numbers that favored the Prussians. Our game scenario attempted to recreate the attack on Leuthen village, rather than trying to do the entire battle from start to finish. 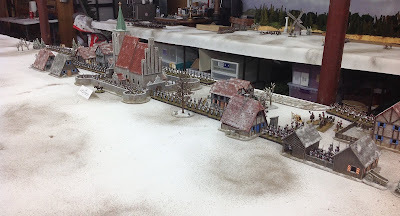 The Prussian objective was to capture the churchyard and drive the Austrians out of Leuthen. Grand vista view of Leuthen village - picture commissioned by the local chamber of commerce. 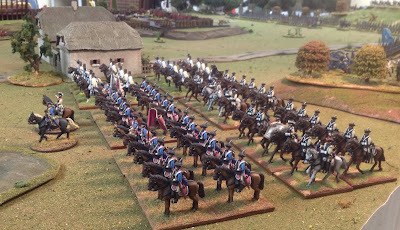 As the scenario designer, I positioned the cream of the crop of Prussian battalions in front of the Leuthen churchyard. 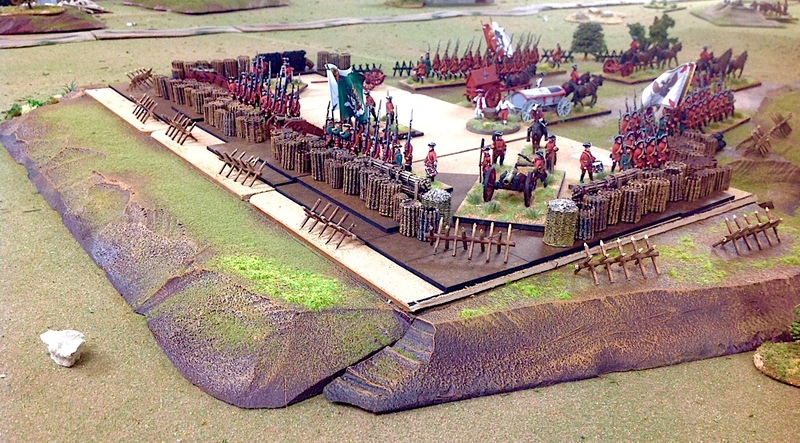 There were two Guards battalions and two grenadier battalions, assisted by a pair of heavy 12-pound cannon. 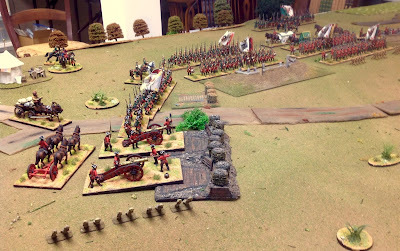 I envisioned that the Prussians would weaken the defenders of the churchyard with a couple of turns of bombardment before going in for the churchyard assault. 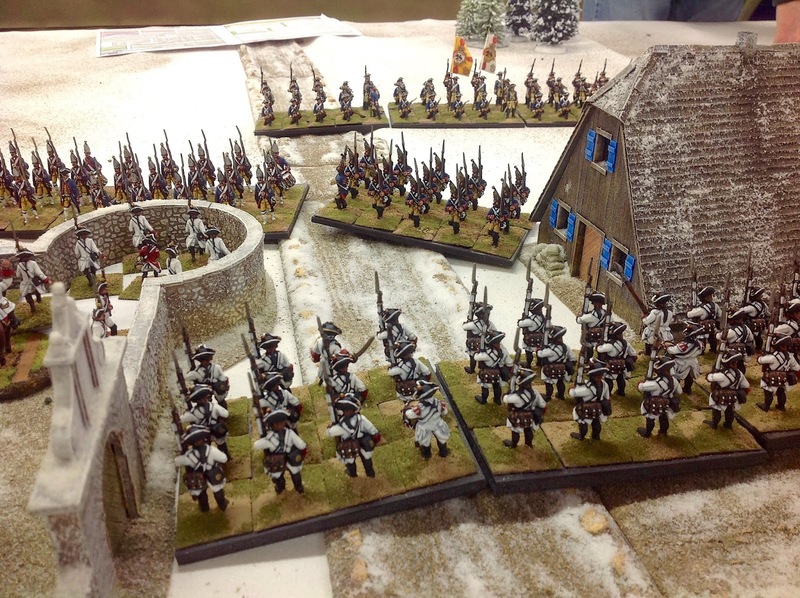 The Prussian deployment in front of the Leuthen churchyard. Click to enlarge the annotations. Well, the Prussian attack on the churchyard started out alright, with the two Guards battalions converging on the churchyard as shown in the picture below. Note the empty street on the right side of the picture and envision Prussian troops in miter hats rushing into the gap and breaking through the church's gate. Alas, that is not what was going to happen. 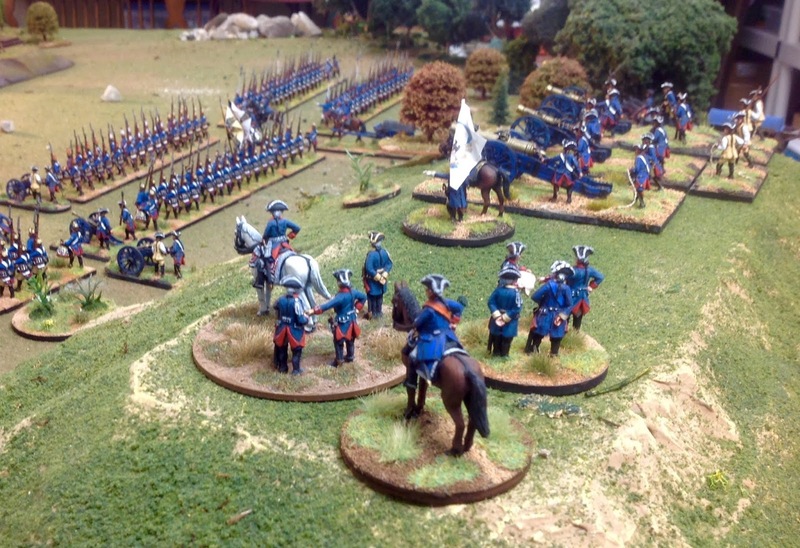 Two regiments of Prussian guards close in on the Leuthen churchyard. A counting of noses or heads indicates that the Prussian Guards outnumbered the Rot Wurzburgers in the church by a wide margin. However, the Prussians made no attempt to charge into the churchyard. It appears that they decided to wear down the garrison with musket fire before attacking the walls. Eventually one of the Guard battalions drifted off over to its right to assist the attack in that vicinity, leaving just the one remaining Guard battalion in front of the church. King Frederick must have wondered, "what is going on and why aren't my Guards inside the churchyard by now?" 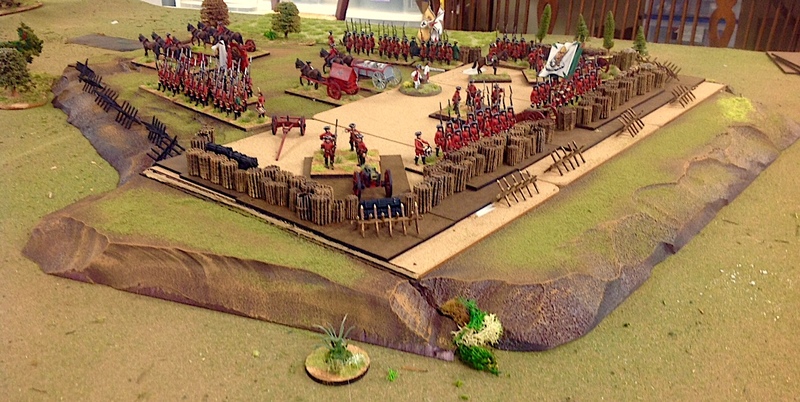 The Guards brigade had been deployed (by me before the game began) with two regular grenadier battalions positioned to rush the church and soak up musket balls and wittle down the garrison. Then the two Guard battalions were to follow up and surge over the churchyard walls and on into the village. By the end of the game, I looked at the two Guards battalions and they had suffered very little in the way of casualties. 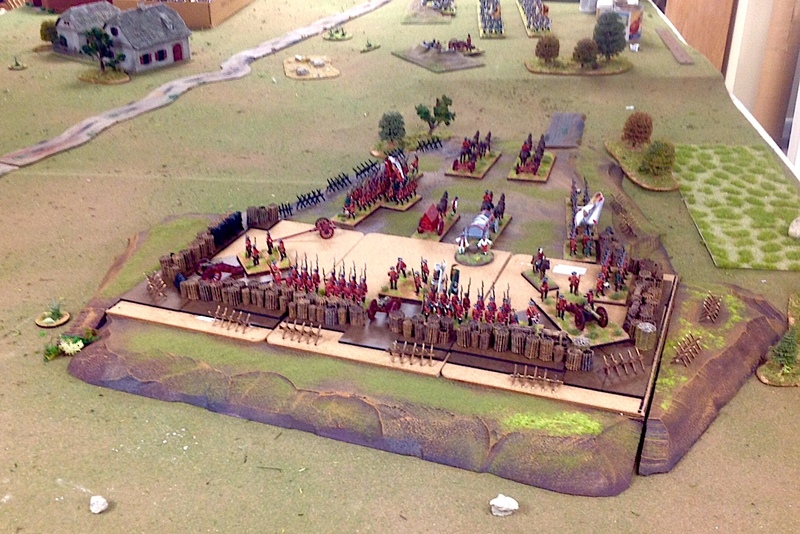 Overhead view of the Prussian infantry converging on the churchyard. Austrians defend the east gate of the churchyard. by the Austrians in the streets and in some of the houses. 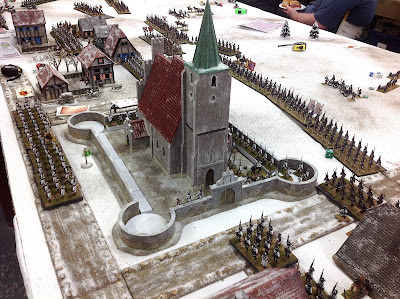 While the mighty Guards Brigade was taking their time trying to capture the churchyard, the left wing infantry of General Hulsen advanced smartly towards the eastern half of the village and quickly engaged the Austrians in a firefight. They mauled the Austrian musketeer regiment that bravely stood out in the open. 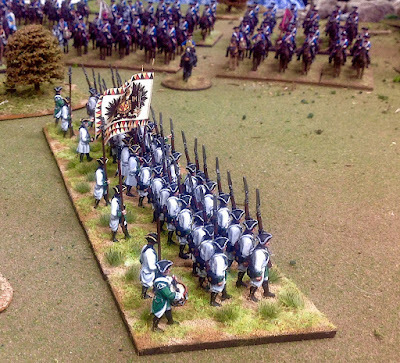 Then a reserve battalion of Austrian grenadiers strode forward to take the place of the musketeers and they too were in for rough treatment at the hands of the Prussian Prinz Ferdinand regiment. 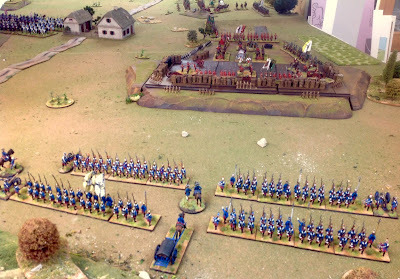 Hulsen's Prussian brigade closes in on the Austrians deployed on the eastern edge of the town. First fire is about to happen. in a firefight along the eastern edge of the town. The Austrian grenadiers made a brave stand before the threat of being outflanked forced them back into the streets of the village. 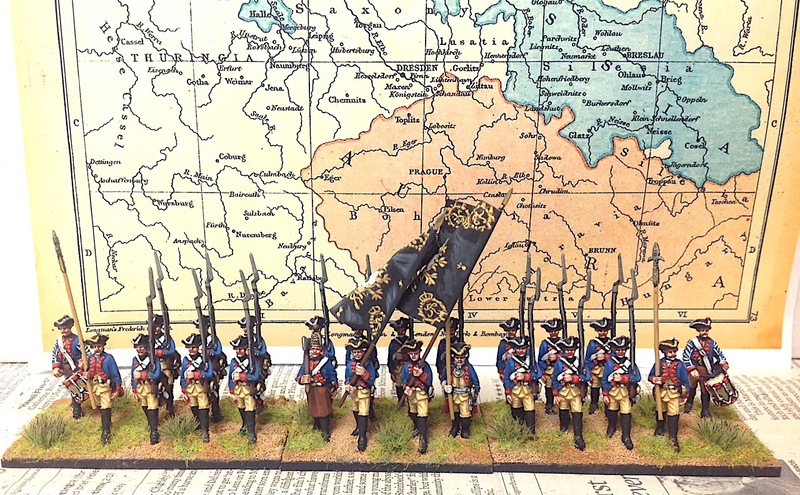 The Prussian Gensdarmes cuirassier regiment had an opportunity to ride down the Austrian grenadiers in the streets, but the card draw initiative favored the Austrians. 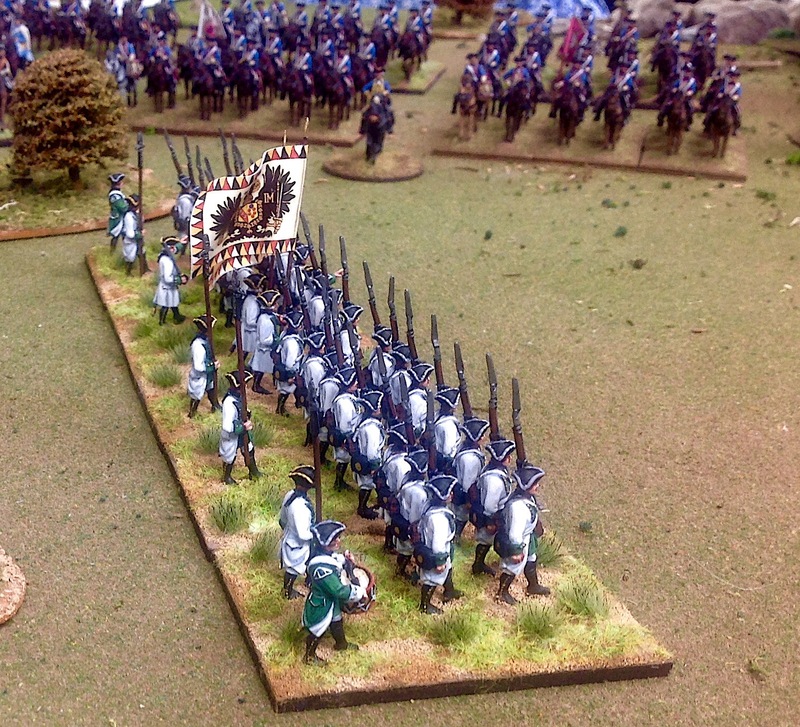 Still, the IR5 Alt Braunschweig regiment arrived from the area of the cavalry action on the far left and deployed on the flank of the grenadiers, who were now faced front and flank by blue coats. This forced the Austrians to pull out of the eastern part of the village and fall back on the reserve position on Windmill Hill. 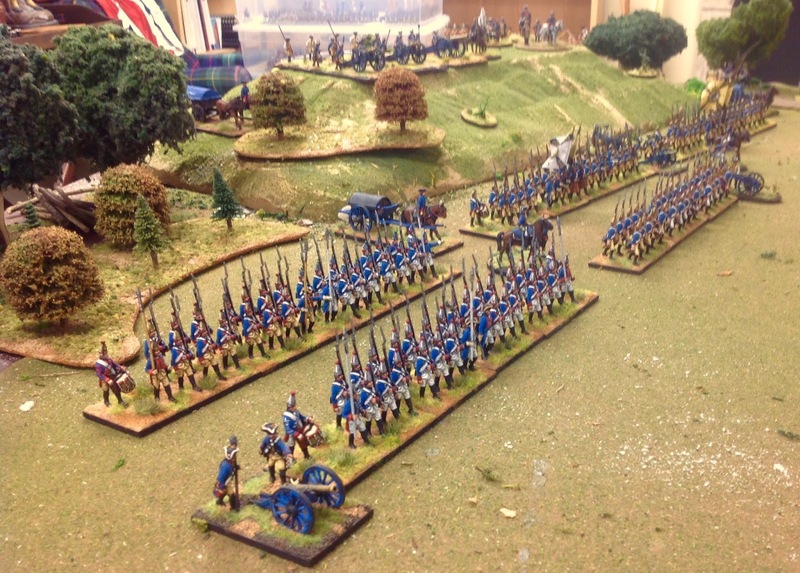 Austrian grenadiers are about to be outflanked by Prussian reinforcements from the left wing cavalry field. As time expired on the game, both sides agreed that the Prussians had captured enough of the village, or at least threatened to with more time, to compel the Austrians to retire, albeit in good order, from the village and fall back towards Breslau. That's pretty much what happened historically.